The canvas element is part of HTML5. It allows for dynamic, scriptable rendering of 2D shapes. It allows a developer to draw just as an artist would on their canvas; albeit, without the same creative flare an artist may have. As I’m a developer I couldn’t resist having an attempt. They first step was to come up with a project to do. Not being that creative I decided to draw a speedometer – similar to the ones we see in most cars. Initially it sounded quite simple, although, I did find parts quite tricky. This was due to my less than impressive maths skills and inexperience with the Canvas implementation. 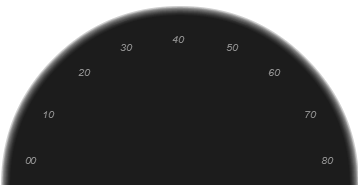 I’ll start with the end result and then explain how the parts of the speedometer were rendered. With any luck some skilled mathematician will be able to explain the maths I’ve used because I have managed to get it working without fully understanding the mathematical theory :-). The image below was drawn using HTML5’s Canvas implementation. and, finally the needle and its base. The combination of drawing each of these components results in the complete speedometer. The following code is stripped to the minimum in order to draw the speedometer above. * If canvas is not support alert the user. /* Two tick in the coloured arc! * line I need to draw at angle represented at Tick. * in the direction from the center of the gauge. * angle that represents the options.speed value. If all those layers are drawn sequentially we end up with this! Hi Ray. I love this article of yours. I’ve been working with HTML5 as well, though haven’t worked on canvas yet. I wish to reblog this article, may i? Thanks for the feedback. I would really appreciate the reblog, thanks! Thank you for your detailed explanation on how to draw this speed dial. Where can I find the reference to the function drawSpeedometerPart ? Thanks. I found the source code. Thanks. Glad you found it. I hope you find it useful. Ray, I Need to place two dials on a single canvas. How can I use the javacript in such a case? Hi Jcole, The draw function obtains a handle to the canvas object and then uses this canvas to draw the speedometer. To have two speedometers on the same screen you could simply have two canvas elements with difference ids. Then if you modify the draw function to take the id of the canvas object it will then draw a speedometer on each. Is there any way to manage the speed of the needle? It is too fast. I am wishing for more dynamic effect like it slowly reaches to the value. (Pardon me for my ignorance, I am new to HTML). It should be simple to add the feature you require. I would simply add a timer that adjusts the current angle in small intervals until the needle reaches the desired location, at which point the timer should stop. Chandar, I’ve updated the source code to show you want I mean. Thanks a ton! 🙂 Really Really appreciate it.. I want to caliberate the meter between values 10 to 40. Hi KP, the calibration is simply a case of converting your values to the corresponding values along the semi-circle. 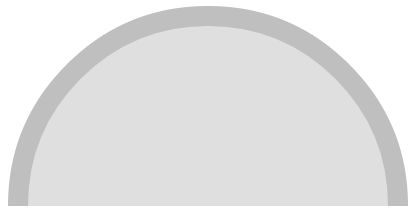 For example the semi-circle cover 0-180 degrees and your range covers 0-30 (adjusted by 10 for the screen display). This, the 50% mark on your range would be 15 which is equivalent to the 90 degrees mark on the 180 degree arc – simple mathematical conversion. The colours are also easily altered, look at the 3 variable in the function drawSpeedometerColourArc. Is it possible to dynamically change the needle’s position ? Yes, the needle can be changed dynamically. For example, you could connect to a server using an AJAX long wait, or, Web Socket – when the server has a new speed this can be passed from server to the client. Within the client you can simply called the function ‘draw(iSpeed)’. Hi, it’s a great article. Now, I’m making some alterations with needles. I want to change the length of needle – is there easy way to do that? Thanks for the feedback. The needle is drawn within the function drawNeedle(). 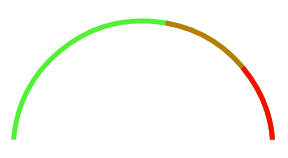 This function references the variable gaugeOptions.radius. Adjusting the value of this will affect the length. Hey there. That article is really great, but i got a little problem. Always when i want to start it, i get the message “buildOptionsAsJSON is not defined”. What i have to do here to make it go away? It would be wise to pull the full source code from there. in this article? I’d really like to be a part of community where I can get suggestions from other experienced individuals that share the same interest. If you have any suggestions, please let me know. Many thanks! I also recommend reddit groups for HTML5 and web development. Hi Ray, very informative article, thanks for sharing. I’ve managed to make the needle’s position change dynamically, but I’m having trouble recalibrating it to mange a higher range of speeds – say 10x what it is currently. Do you have any suggestions? The only real problem I seem to be having is with the math in the “convertSpeedToAngle” function, but I may be missing something somewhere else…. Anyway, great blog, thanks again! Excellent – thanks for the feedback. Regarding the positioning of the numbers… this can be done much easier. I set textBaseline to ‘middle’ and textAlign to ‘center’. Wow, sounds interesting. I would like to see that. Can you push to my git repo. How to increase the max speed from 80 to something else? To modify the range and thus the maximum value is simply a case of converting your values to the corresponding values along the semi-circle. For example the semi-circle cover 0-180 degrees and any new range covers 0-X (adjusted by 10 for the screen display). Thus, the 50% mark on your range would be x/2 which is equivalent to the 90 degrees mark on the 180 degree arc – simple mathematical conversion. thnx for reply. so if I need to make 80 to 2000, what values in the .js file I have to change? It is not working for me. What i might be missing here. I simply pasted the above code thats all. All i’m getting is an html form with default value 20 in it. Love your explanation btw. Thanks for the feedback. Rather than copy and pasting the code it would be better to download the code from my github repository. If you look at the last paragraph of the Blog you see the links to the source code and a working example. Hope that helps! It’s the drawNeedle function that you should be looking at. That accepts a parameter which holds the angle. Hey Ray thanx for the tutorial its a great and helped a lot to understand the canvas deeply but would like to know if there is a way to fit the arcs according to the reduction of the size. ie if the screen size is small the speedometer tends to fit itself to the screen. very well written and really informative.. Thank you! I did a screen with 10 gauges, each one with different value source (ajax) and it works quickly, also the memory use is minimal. Hi, I am sorry but I tried the codings but nothing comes out of my web page. So can I check with you if the tag are all in the script? 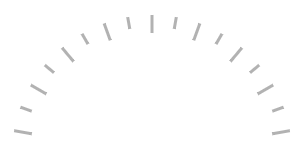 for the Modified speedometer.js so the needle moves frame by frame between values…, do I just have to copy the all the codings into my document? But I dont understand the ‘+’ and ‘-‘ sign at the page as well as the different color. Please advise. The size is programmatically controlled. If you look at the main variables the width and height can be changed. But, I’ve not tested it to determine what side effects this will have! how do I change the color of the text markers from white to any other color? Check to ensure the Ids are unique and match. I sounds like your doing the right thing in creating 4 canvas and changing the Ids accordingly. The function drawTextMarkers draws the text. You should add a line in this function to change the colour, I think ‘options.ctx.fillStyle = ‘blue’;’ should do it. I know, by incremeting the iTick. I would like to change the position of the needle to a fixed position, is that possible? Hard to understand what you are trying to achieve; but, in theory anything is possible. Awesome work , it is helpful for me. thank you. This very good article. I have some mathematics doubts. To calcule x and y i use the lines above. Why i need subtract in case of Y coordinate? Obs: I modify the code to try understand more. Thank you very much .. This is really amazing 🙂 .. But how can I change the position and size of the canvas ? Thanks for this post! This is awesome! You said that the code above could be used freely; would there be a note to the same effect somewhere for the code in the Git repository? Yeah, use freely as you wish. Best of luck. What are you trying to make it do? This is awesome. How can we make it where the speedometer isn’t adjusted 10 deg? I don’t get the point for that. Hey thanks for sharing it ! 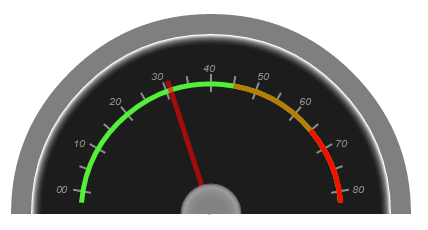 Can we display to needles (with different colors, representing different data) on the same speedometer, at the same time ? Is it possible to display two needles at te same time on the same speedometer (with different colors and data) ? Hi thanks for this amazing speedometer ! Is there a way to rotate text markers ? I believe there is. Talk a look at my code for drawing a dartboard here https://github.com/rheh/HTML5-canvas-projects/blob/master/dartboard/dartboard.js specifically, the drawLabel function. This thing already i implemented in android,but i wants to start the scale from 95 to 120.can you help..plz sir..